Djibouti has nationalized the two-thirds stake in its Doraleh Container Terminal held by the Port of Djibouti, the government said in a statement, the latest twist in a dispute with Dubai's government-controlled DP World dating back six years. 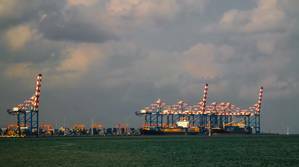 In February, Djibouti ended a contract with DP World, one of the world's biggest port operators, to run its Doraleh Container Terminal (DCT), and seized control of the terminal. A London court later said DP World's contract to run the terminal was still valid. The port of Djibouti, PDSA, is itself majority-owned by the Djibouti state and in turn owns a two-thirds stake in the container terminal, while DP World owns the other third. However, Djibouti said that the terminal had "de facto" come under control of DP World, despite its minority stake. By directly nationalizing the stake owned by PDSA, Djibouti would ensure the government's control over the terminal, the country's presidency said in a statement. "The Republic of Djibouti, has decided to nationalist with immediate effect all the shares and social rights of PDSA in the DCT company to protect the fundamental interests of the Nation and the legitimate interests of its partners," the statement said. "Once again, the Republic of Djibouti clearly reaffirms that the DCT company cannot under any circumstances 'come back' under the control of DP World," it said. "DP World will therefore have the State of Djibouti as a single interlocutor for all the discussions regarding the consequences of the concession contract termination," it said, adding: "That is why a fair compensation outcome is the only possible option for DP World, in line with the principles of international law." DP World, which had said in August that it had sought and obtained protection of its interest in the terminal from a London court, did not immediately respond to a request for comment on Monday.